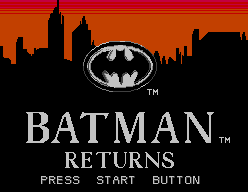 Following on the success of the movie with the same title, Batman Returns was released on a range of platforms including the much loved Sega Master System. Throughout the movie Batman faces off against the deceitful Penguin, who creates an alliance with influential businessman Max Chreck. A revenge stricken Cat-woman is born from a quiet admin worker and teams up with Penguin to try and frame Batman for the murder of a female model. With a lack of cut-scenes, the game itself misses the mark in following the movie's story-line, but does provide some controller gripping platforming game-play. 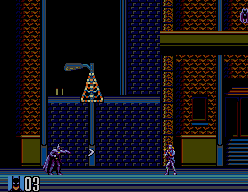 Based on a side scrolling, beat-em-up, platforming game style, Batman Returns offers something unique that differentiates itself from the many other similar games - a choose your own path option. As the player, you will complete five levels although you choose between two slightly different paths when commencing each of the initial four levels. Essentially this replaces a difficulty setting as route one is fairly straightforward and easier than route two, which challenges the player with a greater number of obstacles and enemies, along with a higher difficulty of platforming. Armed with the Bat-rope, Batman can reach bonuses that provide additional lives and increase the speed or range of Batman's Batarang. When playing the more difficult routes the player is forced to use the Bat-rope to navigate between platforms over floor-less areas. Using the Bat-rope to swing between platforms is all about timing. The music suit the games and does well considering the Master Systems 8 bit processor. It is catchy and does become slightly repetitive, but in all bearable if your replying the game for a second, third, or even fourth time. The recognisable dying sound affect did add to my frustration level, although it is soon forgotten about when the action restarts. 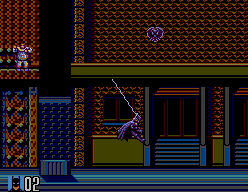 Batman Returns takes full advantage of the Master System two button controller, with the A button firing the Batarang and the B button for jumping and releasing the Bat-rope. By holding the B button down after jumping, provided Batman doesn't land on anything results in him entering a glide which can be helpful in reaching platforms. This game really utilities the Bat-rope, which will result in violent outbursts of anger when you miss latching onto a platform, result in falling to your doom and hearing that recognisable death sound affect. Batman Returns is not a long game with five levels in total. Being able to select different routes on the first four levels adds to the replay value, although there is a lack in variation between levels with all of them forcing the use of the Bat-rope to jump between platforms and the Batarang to kill enemies. The lack of cut-scenes results in a lack of story in the game. Catwoman does make an appearance in two boss battles along with the Penguin in the boss final battle, leaving the regular enemies as generic goons who make up the Red Triangle Circus gang. The game-play is challenging enough, although a bit repetitive. The controls can take some getting used to, specifically using the Bat-rope as it is all about the timing. Being able to select different routes adds something different to the game-play and reply value of the game. Being a Batman fan myself I maybe biased in the scoring, but in all I can say I'm proud to have this title in my library.